Dr. F. W. Upson was born in Geneva, Ashtabula county, Ohio, December 11, 1858, son of Peter and Amelia (Tenney) Upson. His father was born in Botesdale, Suffolk county, England, and in 1836 came to the United States, settling near Painesville, Lake county, Ohio. By profession he was a violinist; indeed, he was the finest violinist in this section of the State. He died in 1873, aged forty-four years. The Doctor's mother is still living, at the old homestead in Geneva, having attained her sisty-seventh year. She is a devoted member of the Disciple Church. They had two children. Frank, the older, is in the employ of the Lake Shore Railroad Company. Dr. Upson received his literary education in the Geneva Normal Institute, and is a graduate of the Western Reserve Medical College of Cleveland, Ohio, with the class of 1882. Immediately after his graduation he established himself in place at Conneaut, where his ability as a physician and surgeon was soon recognized and where he has since conducted an extensive practice. In December, 1883, Dr. Upton married Miss Ruth Kelley, daughter of Dr. J. P. and Mary Kelley, of Geneva, Ohio. They have two children, Mabel E. and Grace C., the pride and joy of their home. Both the Doctor and his wife are members of the Methodist Episcopal Church. He affiliates with the Masonic fraternity, having taken the degrees of the blue lodge, chapter, council and commandery. He is also a member of the Royal Arcanum and is medical examiner for the same. He is a member of the Ashtabula County Medical Society. Personally, the Doctor is of a genial and courteous nature. He is in thorough sympathy with the advancement of every worthy cause in this vicinity, and his many estimable qualities have endeared him to a large circle of friends here. His life furnishes a good example of what will power and perseverance can accomplish when coupled with honesty and strict integrity of character. Professionally, he stands well to the front in eastern Ohio. Burt F. Steins, proprietor of the Central Hotel, Conneaut, Ohio, is a young man of more than ordinary business enterprise and push. By nature and training he is especially adapted for the business in which he is engaged, and seems to be exactly the right man in the right place. He was born in Pennsylvania, January 4, 1862, and is a son of George W. and Esther (Cross) Steins, both natives of Pennsylvania. After his marriage, which event occurred November 24, 1859, George W. Steins settled in Girard, Pennsylvania, where he lived until 1867, when he moved with his family to Conneaut, having, however, done business here previous to that time. In 1882 he turned his attention to the hotel business, and soon afterward to the livery business, carrying on both until 1889. From that date until April, 1892, he devoted his time exclusively to his livery, feed and sale stable, and then, selling out to B. F. Thayer, he retired from active life. Burt F. Steins, the younger of the two sons of George W. Steins and the subject of this article, was employed as clerk in his father's hotel after leaving school, and soon proved himself to be especially fitted for the hotel business. In 1889, he became proprietor of the Central Hotel, which he has since successfully conducted. In 1892, he renovated it and embellished it with all the modern improvements, such as steam heating apparatus, electric lights, etc., making it one of the most cozy hotels on the line between Buffalo and Cleveland. He also deals in horses, usually keeping about a half dozen. Socially, he is a member of the Elks of Conneaut. Mr. B. F. Steins' wife, a winsome and cultured lady, is the daughter of Roderick Frazier, of Meadville, Pennsylvania. They were married at her father's home in Meadville, November 6, 1884. There is no improvement by which strangers judge of the character of a city or town as readily as by the character of its hotel accommodations, and at the present time the traveling public expect and demand a good service from the various hostelries to which they accord their patronage. Thus it is patent that he who would successfully conduct such a public enterprise must be naturally fitted for the business, must look to multitudinous detains, must be genial and gain the good will of patrons and cater to their wants in every reasonable way. Mr. Steins' success in the conduct of his model little hotel gives evidence that he fulfills all these requirements, and he numbers his friends among the traveling public by those who once stop at his house, as the expression goes with the commercial travelers; the house is a first-class place to put up, and the proprietor well merits the success and popularity which he has attained. Plin Smith, deceased, was born in Sheldon, Franklin county, Vermont, August 5, 1802, a son of John Smith, a native of New London, Connecticut. The latter died when Plin was fourteen years of age. The subject of this memoir, however, remained at home until 1821, when he came to Ohio, the greater part of the way on foot, arriving at the house of his uncle, Roger Cadwell, in Andover, February 15, of that year. His first occupation, on reaching this wilderness, was chopping. To procure an ax he cut an acre of heavy timber and piled the brush, and he estimated that this ax cost him at least $7. Mr. Smith then hired out to chop, and continued to prosecute this vocation until he had cleared 100 acres of forest. From the effect of this labor he became an invalid, and returned to his native place. In doing this he was so fortunate as to engage for a gentleman to drive cattle over the mountains to Philadelphia. B. F. Wade was his companion, and they received $9 per month for their service. After arriving home, Mr. Smith learned the trade of wagon making. In January, 1829, he went to Vermont, and in the following October again started for Ohio, and, after about two weeks spent on the road, arrived at the home of the above mentioned uncle. He purchased twenty-five acres of wild land, erected a log house, and began housekeeping. The first wagon he built was hewed from the adjacent timber, his wife assisting him in turning the hubs, and also in sawing logs from which to make the rails necessary to fence their farm. Mr. and Mrs. Smith lived for a time in each Richmond and Austinburg township, but the greater part of their lives was passed in Andover. Mrs. Smith now resides at Conneaut. Mr. Smith died March 20, 1881, aged seventy-nine years. Mr. Smith was married January 25, 1829, to Aurelia Weeks, who was born Aug. 26, 1810, a daughter of John and Elizabeth (Chapman) Weeks. The grandfather of Mrs. Smith, Timothy Chapman, was a soldier in the Revolutionary war, and afterward drew a pension of $96 a year. After his death his wife, nee Avis Curtis, drew the pension while she lived. Mr. and Mrs. John Weeks had two sons and four daughters and Mrs. Smith and a sister, Anna Traver, are the only ones now living. The father died in 1810, and the mother afterward married John Ellithorp. They had six sons, three of whom still survive. The youngest, Albert Ellithorp, is the inventory of the Ellithorp air cushion for elevators. Mr. and Mrs. Smith had eleven children. The eldest, Philo, born June 6, 1830, married Elsie Frink, who died Sep. 22, 1892, aged 56 years. He now resides in Madison, Lake county. Josette, born Nov. 4, 1832, is the wife of E. B. Linn, a physician of Richmond township. Sagito, born Aug. 23, 1834, married Alicia Lake, and now resides in Conneaut. Delia, born Apr. 17, 1836, married Olmstead Baker, and lives at Andover. Mary, born Mar. 28, 1838, married Rev. L. E. Beardsley, a member of the East Ohio Conference, and his death occurred Jun. 14, 1889, at the age of 74 years; their two children are: Mark L. and Jay W., the latter a resident of Conneaut. Mark L., a resident of Ashtabula county, married Dora Snow, and they have two children, Don and Retah. John Harrison, born Mar. 29, 1840, married Martha Hartshorn, and resides at Conneaut, Ohio. Aurelia, born Mar. 12, 1842, married Cyrenus Laughlin, and their home is at Conneaut, Ohio. Eliza Ann, born Mar. 19, 1844, died May 29, 1867. Plin Weeks, born Jan. 1, 1847, married Mary Kelley, and died at Chicago, May 11, 1880, aged 33 years. Amelia, born May 6, 1849, married Prof. N. L. Guthrie, of Conneaut, and died Nov. 10, 1881, aged 34 years. Lizzie, born Dec. 12, 1853, married Charles Morris, and died Aug. 21, 1887, at the age of 33 years. The eldest child of Dr. and Mrs. Linn, Harriet A., is the wife of Dr. Bebee. Both she and her husband were missionaries to China for 7 years, after which they returned to this country for a year, and then went again to China. Dr. Bebee is superintendent of the Philander Smith Memorial Hospital at Nanking, China. The eleven children of Mr. and Mrs. Plin Smith were raised to years of maturity, and ten were married. There are now 22 grandchildren and 16 great-grandchildren. Mr. Smith was a life-long member of the Methodist Episcopal Church, with which his widow is still actively identified, having been a member from early youth. Charles F. Westcott, a resident of Conneaut and a conductor on the Nickel Plate Railroad, was born in Buffalo, Erie Co., New York, Dec. 21, 1845. His parents were Jesse and Cynthia (Earl) Westcott, both natives of New York, and his father was one of the earliest pioneers of Buffalo. He bought 32 square miles of land of the Indians, on a portion of which the city of Buffalo now stands, and before Buffalo was incorporated he built the Franklin House, and was its first proprietor. For many years he was engaged in the hotel business there. He was Chief Magistrate in that section of the State, having control of the Indian estate. He and his wife were members of the Episcopal Church. He died Aug. 8, 1862, at the age of 76, and his wife passed away in Nov. 1864, aged 53 years. During the war of 1812 Jesse Westcott and General Wood raised a company of cavalry. The subject of our sketch is the tenth in a family of twelve children, of whom eleven are still living, he being the only one in Ohio. All the others reside in New York except one, Jesse, who is in Michigan. Charles F. Westcott left home at the age of ten years, and for three years and a half was employed as driver on the Erie canal. Then, at the age of 14, he entered the employ of the Lake Shore & Michigan Southern Railroad, and served until 1877, beginning as brakeman and afterward serving as fireman and then as conductor. He was in Buffalo in 1877 at the great strike. Next he turned his attention to the hotel business in that city, being thus engaged there two years. After that he served as brakeman, and subsequently as fireman on the Western New York & Pennsylvania, leaving that road in the spring of 1883 to accept a position in the yard work for the Nickel Plate. He has lived in Conneaut since 1889, and been on the road as brakeman and conductor since that date. Mr. Westcott was married in 1873, to Miss Emma Pierce. Her father James Pierce, was a resident at Buffalo and a carpenter by trade. He died in 1879, aged about 42 years. Mr. and Mrs. Westcott had four children, namely: George F., born Aug. 13, 1874; Charles H., Aug. 12, 1877; Addie S., Aug. 13, 1879; and Murry T., Sep. 5, 1886. George F. has been a brakeman on the Nickel Plate since 1891. All the rest are attending school. Mrs. Westcott and three of the children are members of the Methodist Episcopal Church. Of Mr. Pierce's family we make record as follows: Esther, the oldest, is the wife of J. G. Simpson, and has three children: Robert G., Etta and Mary; John C., the second, died at the age of 33 years; Orin, who married Maggie Lang, has two children: Orin and Laura; and Mrs. Westcott, the youngest. As a railroad man Mr. Westcott is prompt and efficient, ever discharging his duty with the strictest fidelity; as a citizen, he ahs the respect of all who know him. He is a member of the Order of Railway Conductors, and Junior Conductor of the same. Politically, he is a Republican. C. W. Poole, traveling engineer on the New York, Chicago & St. Louis Railroad, Conneaut, Ohio, was born in Essex county, Massachusetts, December 25, 1847, son of Charles and Eunice Eliza (Pison) Poole, both natives of Massachusetts. Charles Poole was born in 1820, son of William and Mary Poole, who were natives of England, came with their parents to America when children, and were reared in Manchester. Both were highly respected people and were members of the Methodist Episcopal Church. They had a family of five children, Charles and Anna being the only ones now living. The latter is the wife of William Alden and resides in Brooklyn, New York. Charles Poole is a merchant tailor and is well and favorably known in Massachusetts, having been engaged in business there for more than half a century. For the past year he has been located at Worcester, having moved to that place from Newburyport. He is a member of the Episcopal Church, as was also his wife. She died in Sep. 1886, aged 54 years. They had thirteen children, seven of whom died in early life; the other six are still living. C. W. Poole was a mere boy when the war broke out, and in June, 1862, before he was fourteen and a half years old, he enlisted in Company B, Thirty-fourth Massachusetts Volunteer Infantry, and, young as he was, rendered efficient service for the Union cause, remaining in the army three years and two months. He was with the forces that operated in the East, and participated in numerous prominent engagements. June 16, 1865, he was mustered out of the United States service at Richmond, Virginia, and, July 16, out of the State service at Boston. He never received a wound nor was he ever taken prisoner. At the close of the war, and before he was 18 years of age, he entered upon a railroad career. He began as brakeman, was then fireman, and in Nov. 1869, was promoted to engineer on the Worcester & Nashua Railroad. He came West to Norwalk, Ohio, in 1870, and was employed as fireman on the Lake Shore & Michigan Southern Railroad, serving in that capacity several months. Later he was fireman on the Grand Rapids & Indiana, afterward was engineer on the Pan Handle, and then passenger engineer on the Nickel Plate. For the past five years he has occupied his present position as engineer on the New York, Chicago & St. Louis Railroad. Aug. 20, 1871, Mr. Poole was married to Miss Mary E. Howe, a native of Peru, Illinois. They have two daughters, namely: Winnefred, wife of C. C. Cadle, of Conneaut; and Mattie, at home. Mrs. Poole and daughters are members of the Methodist Episcopal Church. Politically, Mr. Poole is a Republican and takes an active interest in politics. He is a member of the B. of L. E., in which he is secretary of insurance. He also affiliates with the I. O. O. F.
Stephen B. Buss, a self-made man and representative farmer of Ashtabula county, Ohio, is deserving of some personal mention in his work. William Gilman Buss, his father, was born in Vermont, in 1810, and about 1849 removed from the Green Mountain State to Ohio, making the journey hither by way of the New York and Erie canal and lake, and settling in Conneaut township, Ashtabula county. Here he remained until his death, in 1862. By occupation he was a farmer. Politically, he affiliated with the Republican party, and, fraternally, with the I. O. O. F. His father, William Buss, the grandfather of our subject, passed his life and died on a farm in Vermont. The Buss family have resided in America since before the Revolutionary war. Electa S. (Cook) Buss, the mother of Stephen B., was born in Vermont, Jan. 19, 1814, and died Dec. 1, 1892. She was the daughter of John and Phoebe Cook, natives of Germany. William G. Buss and Electa S. Cook were married in 1841, and in time became the parents of three children, viz. : Minerva, wife of G. W. Salisbury of Conneaut township, Ashtabula county, Ohio; Maranda, wife of Frank Willard of Cleveland, has one son and seven daughters; and Stephen B., the oldest of the family and the subject of the article. Stephen B. Buss was born Oct. 16, 1843, and remained with his parents as long as they lived. When he was 25 years old he bought the home farm, about 100 acres, upon which he has since been engaged in farming and stock-raising, making a specialty of the sheep business, in which he has been very successful. He was married in 1867 to Della Smith, who was born in this county in 1848, daughter of Barlett B. and Eliza (Cheney) Smith, natives of New York and Vermont respectively. Her father passed sway June 5, 1891, and her mother in March, 1872. Both were members of the Universalist Church. Mrs. Buss is one of a family of ten children, two of whom are deceased - an infant and Lovina. Those living are: Sidney, of Hazelton, Pennsylvania; Bessie, wife of J. R. Warner, Special Pension Examiner, Washington, District of Columbia; Abbie R., wife of W. F. Richards, Conneaut, Ohio; Della; Frank W., Sunbury, Pennsylvania, is in the employ of the Reading Railroad Company, as station agent; Fred F., Conneaut, Ohio; John C., a Wichita farmer; and Willis, a grocer at Elmdale, Kansas. Mr. and Mrs. Buss have three children - Gracie, Warner and Helen. Mr. Buss is a Republican and is now serving as Trustee of his township. He is a member of the Knights of Honor. Judge Hamilton B. Woodbury - That distinguished philospher and statesman, Lord Bacon, very truly said that, "Histories set forth rather the pomp of business than its true and inward resorts; but the lives of eminent men, if they be well written, representing individual achievements in the various spheres of life, in which actions both great and small, public and private, have a commixture, must necessarily contain a more true, natural and lively representation." Hence works of history in which biography forms the main part or is largely interwoven, is the most attractive and instructive, and leaves a greater impress on the mind of the reader. Biographies, to be readable, should be so written that they will impress coming generations with the rewards that follow industry, perseverance and merit, and set forth the value of honest individual exertion. Then those who peruse them will try to imitate the virtues therein set forth and will be benefited thereby. These thoughts are suggested by reviewing the life of the distinguished jurist whose name heads this memoir. Woodbury is an old name, of English origin and very prominently associated with the history of this country since the early part of the seventeenth century. It is a name borne by many counties and towns in the different States of the Union. It is a name which fills a large place in the library catalogues and in the dictionaries of authors. It is the name of an ancient numerous and substantial family. The name has been variously spelled, - Woodberi, Woodberye, Woodberry, Woodburie, Woodburye, Woodbury, etc. ; but the pioneer, John Woodbury, who was called the "Old Planter," preferred the latter spelling. John Woodbury, according to the best information, was a native of Devonshire, removing from there to Somersetshire, and from the latter place, according to the disposition of his son Humphrey, he removed, in 1624, to America, settling at Cape Ann, where he was known as the "Pioneer." His farm lay across from what is now Salem. There were no roads or bridges in those days, but there were water ways and canoes in plenty, and it was a familiar sight to see the Old Planter on his way to and from his farm, tending his sail or plying his paddle, and occasionally taking a shot at a duck, brant or goose. He was a man of considerable parts and something of a leader. He became the first Constable of Salem, and the first "envoy," as they were pleased to call him, sent by the settlement to the mother country. He accomplished his mission successfully. Supplies were shipped and the vessel ready. Then, taking his son Humphrey, a lad of twenty years, he bade adieu to old England, and, following the sun, started homeward for the New World, landing at Nahumkeik, in June, 1628. His younger brother, William followed him as early as 1631, with his family, settling at Salem. John and William had each secured a good education for the day and region, John having received sufficient training in trigonometry and other branches of higher mathematics to qualify him for land surveying. He was married in England, in 1596, to Joan Humphrey. By the best authority it is recorded that the first official elected in America was Woodbury. This was done by the governor and his eleven assistants, which included six justices of the peace at a court holden at Charlton, Sep. 28, 1630, at which sitting John Woodbury was chosen Constable. He was also an original member of the first church in Salem. Quite a settlement formed around the "Old Planter." William Woodbury had forty acres there; so also did Laskins, Patch, King, Hardy, Richard and William Dodge, Robert Conant and John Balch. In 1636, he received a grant of 200 acres from the crown. Upon his arrival in America William engaged in agriculture and other pursuits. His lands and town lots are referred to in 1635 and 1636. He was born in 1589, and departed this life in 1677, surviving his brother John by many years, the latter having died in 1641. He left a large family of children, whose descendants, scattered in the different States of the Union, filled from time to time high and honorable positions. But the world has moved since the seventeenth century, and the Woodbury brothers and their descendants have moved with it. Judge Woodbury, the subject of this memoir, is a direct descendant of William Woodbury. He was born in Kelloggsville, Ashtabula county, Ohio, Nov. 27, 1831, and is the son of Ebenezer B. and Silva (Benson) Woodbury. Ebenezer was the second son of Wheeler Woodbury, a native of New Hampshire, who removed to Ohio in 1812, settling in Ashtabula county, where he was engaged in farming, suffering all the hardships and deprivations incident to pioneer life. His wife, Maria, was a relative of the distinguished Pease family of New Hampshire, and a cousin of General Putnam, of Revolutionary fame. They were the parents of three sons and five daughters. Of the sons there were Nathan, who was a farmer in Huron county, Ohio, where he finally died; Ebenezer B., and Wheeler P., a farmer who lived in Monroe township, Ashtabula county, where he died a few years sine. Ebenezer, the father of the subject of this biography, was born at Acworth, New Hampshire, Aug. 5, 1805, and died in Jefferson, Ohio, Aug. 12, 1870. At one time he was a distiller, and later a merchant; was successful in his business operations and accumulated quite a fortune. He resided for many years in Kelloggsville. Rather late in life he began the study of law at Conneaut, Ohio, under the distinguished jurist, the late Horace Wilder, and was admitted to the bar at Jefferson. Subsequently he formed a partnership with Judge Chaffee, and the firm became one of the leading ones of the county, securing a large portion of the legal business. The partnership continued for about twenty years. Mr. Woodbury was elected to the Constitutional Convention of 1850, and distinguished himself for his efficient service. Politically, he was originally a Whig, later a Free Soiler, and was among the first to give his support to the Republican party. By his wife, Sylvia, who was a descendant of an old and prominent family of New York, he had six children: Hamilton B., our subject; Almira, now the wife of James A. Davidson, of Jefferson; Edward B.; Silva M., wife of F. W. McEntyre; Delia, who died when abut twelve years of age; and Lucius K.
Young Hamilton was reared at home, securing his education at the commercial and high schools of his native county. He selected law as his profession, and at the age of seventeen entered his fathers office and began his studies. At the age of twenty-one he was admitted to the bar at Jefferson, and in 1857, became the junior member of the law firm of Chaffee, Woodbury & Woodbury. Thus the subject of this biography was happily launched in the profession of which he was destined to be a bright ornament. Upon the election of Mr. Chaffee to the bench in February, 1862, the firm became Woodbury, Woodbury & Ruggles. Not long after he settled in Jefferson, Mr. Woodbury was elected to the office of Mayor, which position be ably filled, inaugurating during his term many reforms and materially advancing the municipality. In 1872 he was elected by the Republicans a member of the State Constitutional Convention, and was an able second to the work of his father had begun. In 1875 he was chosen Judge of the Court of Common Pleas, the duties of which he discharged with marked ability until 1885, when he was elected Judge of the Seventh Judicial Circuit, to which position he was re-elected in 1891, for the second term of six years. Judge Woodbury was united in marriage, at Jefferson, October 24, 1854, to Miss Mary E., daughter of Peter and Sallie (Wellington) Hervey, a native of New York, and an accomplished lady. They have four children: Fred H.; Jennie, now the wife of Ralph Stone, a prominent farmer of the county; Hamilton B., Jr. and Walter W.
A few thoughts in regard to Judge Woodbury as lawyer, judge and man, will close this biographical sketch. From the time he adopted law as his occupation he has been devoted to it and his chief aim in life has devoted to it, and his chief aim in life has been to be useful and to adorn the profession. He has always been a close and deliberate reader of the law, going into wide research for authorities. He is careful and painstaking, and masters in his cases as far as possible before going into court, when he brings out their full strength. His briefs are clear, sound and to the point. He is a good advocate, but his great power is in examining and bringing into bold relief intricate points of a cause, and in his analyzation of every feature pertaining to it. In the trial of cases he was never known to resort to petty tricks or take any undue advantage of a brother attorney, or to oppress a client. As a judge he is quick to detect the strong or weak points of a case, every feature of which is brought before his analytical mind as the trial proceeds. His decisions are rendered with clearness, force and impartially, and rarely if ever are they reversed by the higher courts. He is a great favorite with the members of the bar, as he always treats them with uniform kindness and courtesy. These qualities, added to the confidence which the public has in him, attest that he is an ideal jurist, - one of the best and ablest that ever presided over the Seventh Judicial Circuit. In personal appearance the Judge is of medium height, well and compactly formed and of attractive presence. His face, which is full and bearded, is expressive of intellectuality and firmness and is made additionally attractive by bright brown eyes that beam with kindness and sympathy. In private life Judge Woodbury is domestic, and his character is pure and unsullied. He is kind, devoted, indulgent and affectionate father. He is a firm friend, a good neighbor and a charitable citizen. William M. Mathews, conductor on the Eastern Division of the Nickel Plate Railroad, and a resident of Conneaut, was born in Pierpont, Ashtabula county, Ohio, November 14, 1853, his parents, Benjamin and Olive (Simmons) Mathews, both being natives of this county. Benjamin Mathews was a carpenter by trade and was well and favorably known all over the county. He died in 1855, aged 47 years. He was a member of the United Brethren Church. The mother of our subject was married three times. Her first husband was Benjamin Jones, a native of this county, and her last marriage was to Solomon Tyler, a native of Conneautville, Crawford County, Pennsylvania. By Mr. Mathews she had two children, William and Selden, the latter dying at the age of twenty years. Her children by Mr. Tyler, were O. B. and Benjamin. She died July 20, 1880, in her seventieth year. William Mathews worked on a farm until 1872, when he entered upon a railroad career, beginning as a brakeman on the Erie & Pittsburg Railroad. He next served in the same position on the Pittsburg, Fort Wayne & CHicago, and on the New York, Pennsylvania & Ohio. While on the last named raod he was promoted to conductor. In August, 1883, he came to Conneaut and accepted a position as brakeman on the Nickel Plate. He has remained in the service of this company ever since, and the past six years has been conductor. His whole railroad experience has been characterized by careful attention to business. He has been in three wrecks, but in none of them was he held responsible. One was on the Erie & Pittsburg and one on the New York, Pennsylvania & Ohio, he being brakeman in both cases. In the other he was conductor on a freight train of six cars when he had a collision with an excursion train that was running on his time, and although he had a collision with an excursion train that was running on his time, and although he did everything in his power to avert the catastrophe it was of no avail. This was at Silver Creek, where eighteen persons were killed and six wounded. Mr. Mathews was married September 6, 1876, to Miss Justina Broughton, daughter of William and Esther (Flowers) Broughton, natives of New York and residents of Crawford county, Pennsylvania. Her parents moved to the farm where they now live February 18, 1892. Her father is seventy-five years of age, and her mother seventy. Recently they celebrated their fiftieth wedding anniversary. Of their children we record that Lucy, wife of L. W. Odel, resides in Stoneborough, Pennsybania; Addie, wife of J. E. Fenner, lives in Lyonsville, Pennsylvania; Ette, wife of M. B. Young, Ashtabula, Ohio; Mary, wife of Frank F. Hicksin, Conneaut; Aurilla, at home; Mrs. Mathews; Edith, cashier in Mr. Pelton's store for the past four years. Mr. and Mrs. Mathews having one child, Edith M.
Mr. Mathews is a member of the K. of P. and of the O. R. C., Nickel Plate Division, No. 145, Conneaut. His political affiliations are with the Republican party. Captain James P. Woodworth was born at Kingsville, Ashtabula county, Ohio, August 2, 1845, a son of James and Martha (Sackett) Woodworth. The father was a native of New York State and came at an early day with his parents to Ohio, being among the early settlers of Ashtabula county; his paternal grandfather was a soldier in the war of the Revolution. James Woodworth is still one of the leading agriculturists of Geneva township, and is well preserved in both mind and body at the age of seventy-seven years; he was for many years manager and part owner of a large furnace at Amboy, Ohio. Captain Woodworth was reared in Kingsville township, his youth unmarked by special incident until September, 1862, when he answered the call for men to enlist in defense of the nation. He became a member of Company F, Second Ohio Cavalry, and was in active service until peace was declared. He was taken prisoner at Morristown, Tennessee, December12, 1863, after he had been wounded by a minie ball; he was confined at Belle Isle and at Pemberton, but was paroled and exchanged in October, 1864. Again in active service, he was wounded at Dinwiddie Court House, and is now a pensioner of the United States Government. After the war was ended he turned his attention to photography, and for twenty-three years devoted his time to this art, retiring at the end of this period to his farm. Since 1878 he has been Captain of the State militia at Geneva. Politically, he is identified with the Republican party. He is a member of the G. A. R., and is Commander of his Post. He was married Oct. 11, 1867, to Ruby M. Thorp, who was born May 22, 1853, a daughter of Dennis and Clarissa Thorp. Mr. Thorp was the first Mayor of Geneva, and for 21 years was one of the energetic and enthusiastic workers in the ranks of the Republican party. Mrs. Woodworth is also a photographer, and previous to her marriage and afterward devoted much of her time to the profession. Three of her brothers, Jason O., Henry H., and Freeman, were soldiers in the late war; Henry H. is the founder of the Geneva Times, and Freeman was for several terms a member of the State Legislature. Captain and Mrs. Woodworth are the parents of four children: Roy D., born May 22, 1874; Hottie R., born Mar. 22, 1881; Nora P., born Aug. 1, 1883; and Nellie C., born Dec. 22, 1886. John W. Redington - Among the countless occupations which men lend their time and energies there are a few that are fraught with greater responsibilities or that demand a more perfect mental and physical balance than that of the locomotive engineer. A grave responsibility rests upon the shoulders of him who essays the duties of such a position, and careful preparation and discipline are demanded. John W. Redington, of Conneaut, Ohio, is one of those clearheaded men to whom as come such preferment as a result of unmistakable ability and fitness for the work, and he now holds a desirable position as engineer on the Nickel Plate Railroad. Mr. Redington was born at Salem, Columbiana county, Ohio, May 5, 1864, his parents being Michael and Ellen (Burke) Redington. The father was born in Ireland and the mother in England, though she also was of Irish descent. They were married on "the ould sod," and while still in the fresh vigor of their young life turned their faces toward the land of promise and came to America in 1862. They located at New Haven, Connecticut, where, for a time, Mr. Redington followed his trade, that of stone mason, subsequently being concerned as a railroad contractor, and having charge of the construction of the roads. He removed, after a few years, to Salem, Ohio, and for twelve years gave his attention to railroad contacting. He held various offices in the gift of the people of Columbiana county, having served two terms as County Commissioner. He has ever taken vital interest in the political affairs of his adopted country, having, in early years, been a member of the Democratic party, but for the past eighteen years of the Republican. He is now retired from active business, and at the mellow age of sixty-eight years abides in well-earned repose at his pleasant home in Salem. Mr. Redington has been twice married, and two children were the result of the first union and six of the last. The second wife, a gracious helpmeet, is still living, at the age of forty-six years, secure in the love of husband and children. Of the eight children death has claimed not one, and it is but consistent that we make the following record concerning them: Mary is the wife of William O'Brien, who is a resident of Kinsey, Kansas, and is Roadmaster on the Atchison, Topeka & Santa Fe Railroad; Stella is the wife of John McGlyntcy of Salem, Ohio; Maggie, the oldest of the second family, is the wife of Jefferson Crouch, and resides at Salem; our subject; John W. was the second-born of the second family; Patrick; Michael; Sadie and Alice, the tree youngest of the family, are still at home. All with but one exception, are devoted members of the Roman Catholic Church. John W. Redington, to whose life this sketch has particular reference, learned the machinist's trade in the engine works at Salem, Ohio, continuing his connection with that concern for about three and one-half years. He then found it to his advantage to make the change, and accordingly he resigned his position and accepted on in charge of the machinery utilized in the operation of extensive coal mines in the Ohio coal fields. In this connection he remained about two years, then went to Alliance, Ohio, and took charge of the great engine of the Alliance Hammer Works. After six months, and looking to ultimate results, he accepted a position as fireman on one of the engines of the Cleveland & Pittsburg Railroad. After about three years, and again descrying an opportunity for a better field of labor, he came, in 1886, to Conneaut and took position as fireman on the Nickel Plate Railroad. Eight months of faithful and capable service in this connection resulted in his promotion to the position of engineer, and he has remained thus employed ever since. Each of the changes made was purely voluntary on his part and each was the result of a wise discernment. Good luck, so called, has attended his labors as engineer; he has never met with any accident. It is fatuous to ascribe this condition to luck, for, rather, it is the result of constant care and practical ability on his party. Mr. Redington was married October 16, 1889, to Miss Ida, daughter of Benton and Julia (Joseph) Smith, residents of Columbiana county, Ohio. Mrs. Redington is the younger of the two children, her brother, John, being a prominent farmer of Columbiana county, Ohio. He is happily married and has two children: Nellie and Lida. Mr. and Mrs. Redington have one child: Sophronia Juliette, a precocious and winsome little maiden, about two years of age. Mr. Redington and his estimable wife are consistent members of this Congregational Church, and he is prominently identified with the Masonic and other civic societies. He is a member of the blue lodge, chapter, council and also of Cache Commandery in the Masonic order; of the Brotherhood of Locomotive Engineers and the American Protective Association. In politics he is a Republican. Mr. Redington is a man of fine physique, tips the beam at about 210 pounds and has a pleasing address. He is a man who has made it a point to require a broad intelligence upon general affairs, and he is especially well informed in regard to all matters pertaining to his line of work. He is one of the eighty-four individuals who compose the local Brotherhood of Locomotive Engineers at Conneaut. It is somewhat doubtful whether there exists in the State another organization, of equal membership, representing but one line of occupation that can show a better class of men, nor those who, as a rule, are better versed in their profession; have better information in regard to the general topics of the day, or who have more just cause for being proud of their organization. Ira F. Case, yard master of the Nickel Plate Railroad at Conneaut, Ohio, was born in Susquehanna county, Pennsylvania, Nov. 15, 1862. His parents were Orson and Rhoda A. (Wilmarth) Case, both natives of Pennsylvania. His father was a soldier in the Army of the Potomac during the late war, serving several years. Previous to the war he conducted farming operations, and afterward was engaged in railroading, beginning as yard master and subsequently serving as baggage master. He continued as baggage master up to the time of his death, April 24, 1891, aged 68 yrs. From his boyhood up he was a member of the Methodist Episcopal Church, his whole life being characterized by honesty and industry. His widow is a resident of Pennsylvania. She is a member of the Universalist Church. Of their three children we make record as follows: Orney E., the oldest is a conductor on the Delaware, Lackawanna & Western Railroad, having been on the road for nine years; Ira F., the subject of this sketch; and George M., a farmer in Susquehanna county, Pennsylvania, has a large stone quarry on his farm, to which he gives considerable attention and which affords him a handsome income. Ira F. Case was reared on a farm in his native county. At the age of fifteen he began learning telegraphy at Foster, Pennsylvania, and remained there six months. Then he had charge of different offices along the line until he obtained a steady situation at Homer, New York, remaining at that place a year and a half. After this he served as station agent on the Western New York & Pennsylvania Railroad for three years. Then he served as brakeman on the same road, and subsequently as conductor on the Buffalo & Southwest. Since 1888 he has been in the employ of the Nickel Plate at Conneaut, first as yard conductor and then as yard master, his present position. Mr. Case was married in New York, October, 8, 1884, to Mrs. Sarah J. Thompson, daughter of Samuel Peacock, a native of Canada. They have one child, Myrtle E. Mrs. Case is a member of the Christian Church. He affiliates with the Democratic party, and is a member of the Brotherhood of Railway Trainmen of Conneaut. General Henry Keyes, of Conneaut, Ohio, was born November 16, 1793, in New Marlborough, Massachusetts, the only child of Elias and Phebe Keyes, who removed from that point to Conneaut Township, Ohio, in 1814. Our subject received his education in his native State, and sine arriving in Ohio his life has been spent in farming, he being now an extensive land owner and capitalist. He has held numerous offices in this township, having been the first Mayor of the village of Conneaut. The title by which he is familiarly known was given him years since, he having been commissioned as General in the State militia. January 19, 1819, Mr. Keyes was united in marriage with Mary Cole, of Conneaut. They had the following children: Henry P., born February 14, 1820, married Sarah M. Huntington; Alvin C., born October 25, 1821, married Minnie Rupp, and both reside at Cedar Rapids, Iowa; Mary C,, born November 14, 1823, is the wife of Edward Grant, of Conneaut. Mrs. Keyes died in 1824 and July 9, 1829, the General married Vesta Bates of Cummington, Massachusetts. They have had seven children, namely: Marcus B., who married Louisa Gordon, now deceased; Martin B. married Ann Eliza Lloyd; Charles W., deceased in 1854; Elias A., married Charlotte E. Trenton; Phebe A., Russell M. and Milo O. All reside in Conneaut except those designated above. In political matters, General Keyes is a Republican. He is a member of the Masonic order, Evergreen Lodge, No. 222, of Conneaut, Ohio. Calvin Poole, a merchant of Conneaut, is a son of Calvin Poole, a native of Connecticut. When twenty years of age he removed to the State of New York, and, it is said, taught the first school west of the Genesee river. His wife was Hannah Perkins. Of their four children, Calvin was the youngest, and is the only one now living. He was born in Genesee, Livingston county, New York, April 2, 1811, and in 1812 his parents moved to Wheatland, that State, where his mother died in 1813. In 1819 Calvin was "bound out" to Francis Smith, remained with him until 1832, and during that time was not allowed school advantages. After leaving him Mr. Poole drove team one year, receiving $12 per month. December 1, 1834, he was married to Miss Harriet Trowridge, and soon afterward started for Ohio. He, however, went no farther than Allegany county, New York, where he made his first purchase of land, for $400. One year later he sold his farm, and again started Westward, halting this time at North East, Pennsylvania, for one year, and from that time until the date of his removal to Conneaut, February, 1873, he resided in New York and Pennsylvania. While in the former State Mr. Poole did military duty, in 1841 was appointed on the staff of Colonel Stoner, the One Hundred and Sixty-sixth Regiment, and received his commission from Hon. William H. Seward. In 1855 he was appointed steward of the Erie county almshouse, retaining the position until his removal to Ohio. 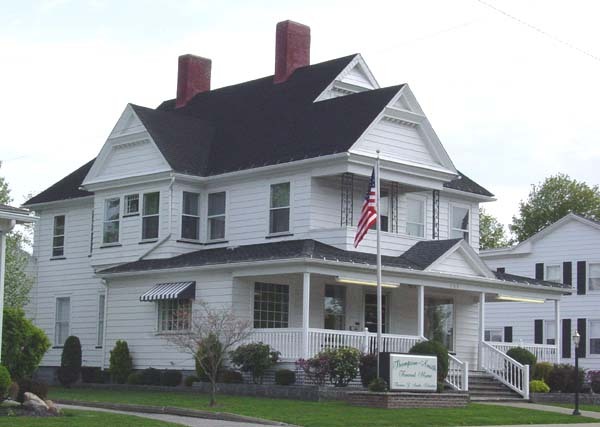 In April, 1874, in connection with John A. Caldwell, Mr. Poole began the mercantile business in Conneaut, in which he is still engaged. Mr. and Mrs. Poole have had the following children: Dolly M., born August 14, 1836, is the wife of C. R. Buchling, of Erie, Pennsylvania; Daniel P., born August 22, 1837, died in October, 1859; Delia D., born November 26, 1838, married John A. Caldwell, and resides in Conneaut; Emeline E., born March 15, 1840, married Benson Bingham, of North East, Pennsylvania; John C., born Nov. 9, 1842, enlisted in August, 1862, in the One Hundred and Forty-Fifth Pennsylvania Infantry, was wounded in the left knee in the battle of the Wilderness, May 12, 1864, for which it became necessary to amputate the limb, which he endured with heroic fortitude, was removed to Fredericksburg, and died there on the 26th of the same month. Almost his last words were, "I am glad that I died for my country." The child was Henry P., born November 18, 1843, married Mary W. Brown, and resides in Conneaut; Harriet S., the youngest child, born September 20, 1850, married Dennis McCarty, and lives in Ashtabula. Politically, Mr. Poole is a Republican, and feels a just pride in belonging to that grand party. There are perhaps few men in the township who have battled with the strong current more successfully than he, and in closing he pays to his companion in life the highest compliment possible: "She always made our home pleasant."